The Hybrid Academy is a unique primary schooling opportunity that pairs classroom learning with home based education, allowing for a rigorous academic program that can be tailored to the individual child's strengths and needs. Our Hybrid model begins with the foundation of a Christian worldview and combines small classes (10 children max) taught by professional teachers with the support of one on one instruction in the home. Classes meet on Tuesdays, Thursdays and Fridays from 9:00-1:00, and students work at home with a parent or other caregiver on Mondays and Wednesdays. Our teachers partner with parents in the education of the child by providing consults on an as needed basis and by regular written communication regarding work that's been completed in class and assignments which are to be completed at home. Hybrid modeled schools are growing in popularity because they provide parents with greater opportunities to be integrally involved in their child's education as well as allowing for more family time during the week. CHLG's Hybrid Academy is faith based in the Evangelical Christian tradition and meets in the annex building of Washington Community Fellowship, 433 9th Street NE. For the 2018-2019 school year we will offer classes for kindergarten through eighth grade, with a hope of expanding into high school in the coming years. Our classes have no more than 10 students per teacher and we use both split classes (two grades combined) as well as single grade classes. Additionally, our partnership with parents is a very important component of our program, as the one to one instruction carried out in the home allows for a unique level of personalization for the student. We use an eclectic approach that includes elements of both the Classical and Charlotte Mason methods. Tuition for 2018-19 is $5550/annually ($555/month) for Kindergarten, $5950/annually ($595/month) for the primary grades (1st-4th), and $6100/annually ($610/month) for middle school (5th-8th). The Hybrid Academy has a cooperative element, and parents/guardians of Hybrid Academy students are responsible to complete 25 volunteer hours (annually) for their first child involved, and 5 additional hours for each subsequent child. This helps to keep tuition costs down and encourages learning in community. See the FAQ tab on the homepage for more information regarding the volunteer expectations for participating families. Families involved in the Hybrid Academy have the option of attending field trips with other families in the program one or two times per month (and siblings may attend these trips as well). Staff members plan some field trips, and families take turns planning trips as well (field trips are voluntary and are held on Mondays or Wednesdays, which are non-class days). Field trips may directly relate to current studies or may simply be interesting, educational opportunities that would peak the interest of the students. In addition to field trip opportunities, families often join together in scheduling weekly physical education or art classes during non-class times either at the school or at nearby facilities. Families choose whether or not they would like to participate in these additional opportunities, and younger siblings can sometimes join in as well. Numerous studies published over the past twenty years have indicated that parental involvement is a key element in a student's success in school. We are seeing this play out and are greatly encouraged by the academic and character growth we are seeing in our Hybrid Academy students. If your interest is peaked, please read more about our program under the Q & A section. If you have interest in such an option please contact us. We would love to talk to you more about our program and offer you an opportunity to come for a school visit. 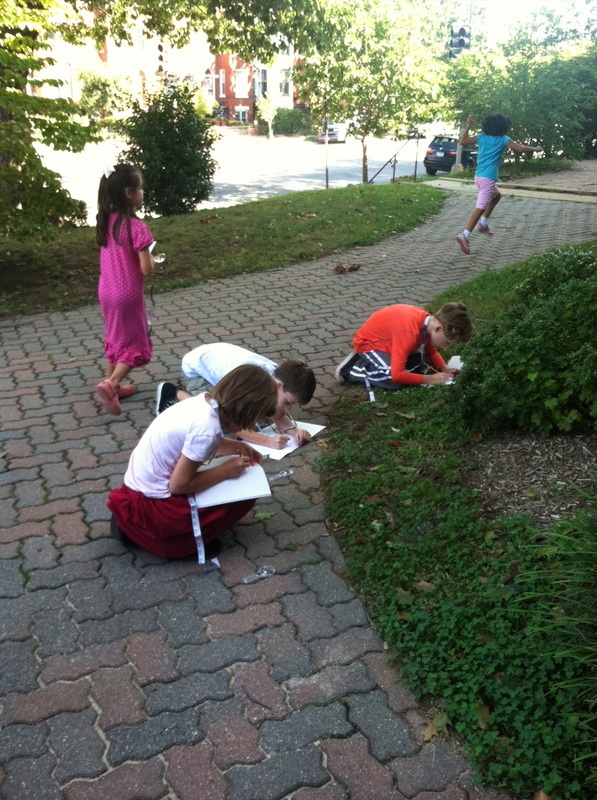 First Graders conducting a science lab on living vs. non-living things.